Harvest when a small crack appears in the stem just above the melon indicating the melon is ripe. Feel, sound and smell are the other tests. Hold a melon up to your ear, if you can feel it squeeze and hear a slight mush instead of a crack it is ripe. Smell is something you learn with experience. It works. The slipping of the stem from the melon with slight finger pressure is an excellent indicator of melon ripeness in the field. Those fruit that show a change of color from green or olive-grey to yellowish brown should be considered ready to harvest. For best quality, walk the patch daily. Honeydew: Harvest when the stem end is slightly springy and the skin begins to take on a creamy yellow appearance. Muskmelons: Harvest when firm, well netted, well formed and at “full slip”. Full slip is when the melon separates from the stem with a slight pressure from the finger. Another indicator of ripening is the skin taking on a slightly yellow appearance under the netting. Watermelon: Harvest when the white background color of the part of the melon that rest on the ground begins to turn creamish to slightly yellow. The drying of the stem tendril nearest the attachment point and green color tone are also indicators of ripeness. Always cut a watermelon from the vine. 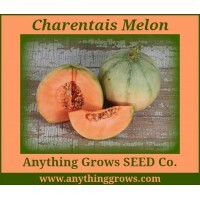 Charentais is a superb Heirloom French Cantaloupe. The bright orange flesh is super sweet and very fragrant. Firm melons that ripen at 2-3 lb. 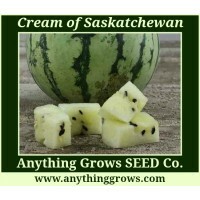 Maturity 85 Days (approx 25 seeds/pk) ..
A beautiful little melon with sweet, tasty, cream-colored flesh! An excellent variety for the north. Fruits around 8-10 lbs each with a striped, green rind. A favorite of those who grow it! An old heirloom. 80 days. 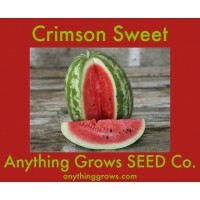 (approx 25 seeds/pk) ..
Quality and reliability in a classic oblong melon with juicy sweet flesh. An excellent variety for gardeners and growers alike, with vibrant red, firm, fine-textured flesh and silver and dark green striping. Resistant to Fusarium wilt and anthracnose. Disease-resistant · 15-25 lbs (Citrullus lanatus). Days to maturity: 85 days ..
Renee's mix of small, crispy-sweet, heirloom “ice box” watermelons with either pinky-red or yellow flesh. Vines are strong growers, with tough and crack resistant rinds. (approx. 45 seeds/pack). Maturity 68-80 days. 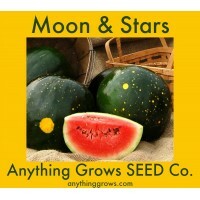 STARTING SEEDLINGS OUTDOORS: Melons need full sun, rich soil and warm temperatures. Plant only when weather is warm and nights stay above 50°F (10°C). Make slightly rounded hills 2 feet in diameter and 5 feet apart. 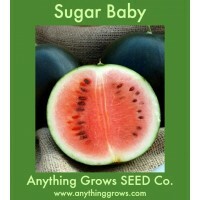 Sow 5 or 6 seeds 1 inch deep and 4 inches.. Extremely popular heirloom with sweet flavor and attractive yellow spots. Dark green rind and foliage are decorated with large yellow spots (moons) and smaller ones (stars). Flesh is dark red with excellent flavor and a thick protective rind. Large oblong fruits can grow to enormous sizes, up to 40 lbs. Requires warm temperatures to set fruit. Introduced in 1926. 10-15 lbs (Citrullus lanatus). Days to maturity: 95-100 days. Heirloom. .. 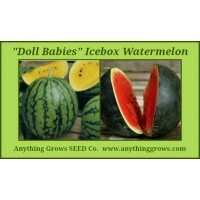 Excellent short-season variety with reliable yields of sweet, juicy melons. The standard for small watermelons! Perfectly round fruits range from 7-8.5” in diameter with a solid green rind and deep red flesh. 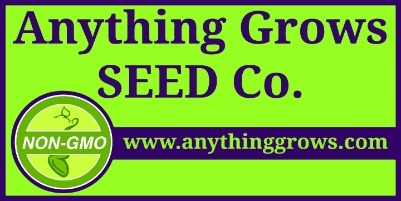 Our strain has been selected for cool growing conditions and high yields. Drought-tolerant • 6-12 lbs. (Citrullus lanatus). Maturity 75 days. ..